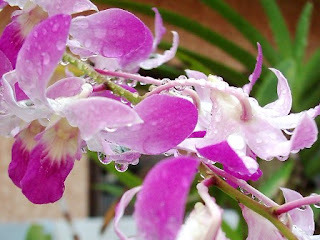 Dainty pink dendrobium orchid with water droplets after the nights rain, was beautifully captured in this photo by my husband. This lovely bloom was also from my small collection of orchids from my small garden in Davao City. Dendrobium is a huge genus of orchids. It is said to have about 1,200 species today. This particular species is easy to grow and blooms well, several times throughout the year. What more, the flowers are long-lasting.